Are you one of the thousands of workers injured from falls each year? Was your loved one seriously injured or killed in a fall? Falling isn't just a hazard for those working on elevated surfaces – anything in the workplace that is capable of causing you to lose your balance is potentially dangerous. If you're suffering an injury from falling at work, contact us immediately. Time is critical, especially if you fell and did not realize until later that you were hurt. We have decades of experience helping injured workers and we can determine right away if you have a case. Call 1-866-943-3427 or submit your information at the top right of this page for a free legal consultation. Working on an elevated surface such as a roof or scaffold puts workers at an increased risk for a dangerous or potentially deadly fall. 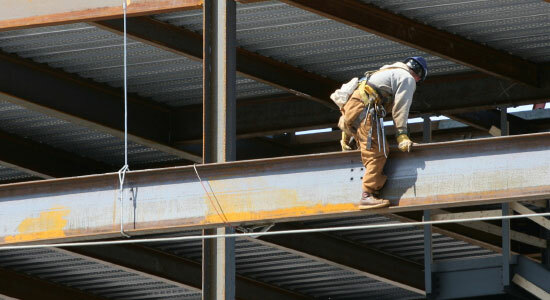 It is mandatory for employees working near an unprotected edge 6 feet above the lower level to be protected with a guardrail or safety net system. Holes aren't always an obvious hazard, especially if you're stepping backwards or your forward view is blocked. When a pier hole, floor hole, excavation hole, or any other type of hole is on a working or walking surface, safety measures such as covers and guardrail systems should be used to protect employees. Clutter and debris, especially when they have protruding nails, present a dangerous fall hazard to workers. In addition to being clean, workplace walking surfaces also need to be structurally stable. Safety precautions such as floor hole covers, guardrails, and safety harnesses can prevent injuries and fatalities, but, with hundreds of workers dying from falls each year, we know accidents still happen. When they do, it's important to have trustworthy legal representation on your side.